See the Snooze Or Lose Video! Walk into any first-period high school classroom and it's obvious: teenagers are exhausted. Sleep deprivation is an epidemic as widespread as obesity - and as problematic. Fortunately, science has answers and Dr. Helene Emsellem has solutions that all parents can use. Affecting the lives of more than 41 million adolescents in the United States alone, kids just aren't getting enough sleep. We know this intuitively as we watch kids frantically juggle a hectic social calendar with the overwhelming demands of school, work, and chores. School performance around the country is suffering - but it's not just grades that are at risk. Sleep deprivation has been found to affect nearly every aspect of a teenager's life, from emotional stability and behavioral issues to physical well-being and the potential for drug and alcohol abuse. For years, we've blamed many of these teenage characteristics to the natural maturing process or changing hormones. And while chemicals do surge through the body creating strong effects, sleep - the right amount and the right kind - has now been targeted as a key to overall success and well-being. Snooze. . . Or Lose! 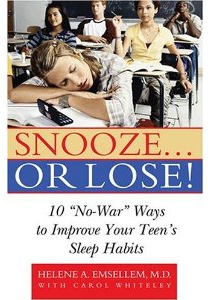 explains the extraordinary role that sleep plays in teens' lives and provides guidelines or helping teens get the sleep they need. Written in a lively and down-to-earth style, with lots of tips and advice from teens themselves, this book will be the go-to guide for parents and kids looking for a good night's sleep.